Believe it or not, I finally hit the wall on time spent sipping margaritas at the pool. Hungry for adventure and a glimpse of the vida real, I asked Fernando (more on Fernando another time) to be our guide on a couple day trips across the region. He graciously accepted. On a bright but cool Thursday morning we woke to our alarm – how else is a girl to wake up before 9 AM? We headed out of town toward La Paz on the highway of eternal construction. After years of construction the work has finally drawn near to Todos Santos, painting a wide, four-lane swath of asphalt across the desert floor. The speed of progress is immediately evident as vehicles hurl past us in a blur darting around semi-trailers. The prospect of exercising the power to pass traffic without facing a head-on collision is almost too much for the local drivers. They are drunk with the right of way. All along the highway there stretch out miles of homogenous life growing from the red earth: cactus, trees, bushes, the occasional highway shrine to a lost motorist and white mile markers. The southern view is distinguished from the northern landscape only by the gray heights of the Sierra Laguna Mountains looming in the distance. Suddenly Fernando braked and veered right off the highway onto a dirt lane etched through dense desert growth. We quickly come up on a mother cow and her 3-4 day old calf. They plodded ahead of us for a while, the calf turning to stare at us more than once with its inky brown eyes. I grabbed my camera to snap a shot. In doing so I accidently hit the power button, lens cap still on. Normally this is not a problem but my “new” refurbished camera was clearly sent to me to test my willingness to “let it go.” It ceremoniously reports with a proud beep-beep that a “zoom error” has ended all hope of me taking any more pictures today. Although I wanted to let out of few beep-beeps of my own, I didn’t think a photographic meltdown in front of Fernando was appropriate – we’d only just met. Instead, I engage in an all day battle between good and camera – hitting the power every 15 minutes or so trying to dislodge the jammed lens. Beep-beep it chided incessantly. In the meanwhile, Fernando treated us to an amazing day of historical, cultural, and botanical education illustrated by – (Murphy’s Law in action) – wildly picturesque locations. First we ventured down the dirt path that snaked through miles of ranchland covered with armies of cactus – several kinds, I now understand – mesquite, beautiful golden trees I cannot name with twisted elegant branches that shine in the sun, and even grand oaks native to only this part of Baja. Every few kilometers a cow would be tucked between the spiky trunks of this dry but shady habitat. Fernando explained that this time of year – the last month of the long dry season – the livestock have gone since December with very little available water. Some ranchers will have to round up their heard from among these dense tangles of desert forest to sustain them. If you, like me, have a vision of cowboys riding at full canter, lassos whirling over head chasing down cattle, you’ll need to recalibrate. As I stare out the window at the snarl of passing landscape dotted by the occasional off-road cow, I image the Baja caballeros job is more like a Blackwater special ops assignment. What do they do – low crawl to the animal and drag it out? We pull up to our first ranch home of Valle de Perdido – The Lost Valley. It is hard to describe theses structures as the hovels that they are by American standards once you gain respect for the caballero life. Rather, the earthen walls seem like a milagro of engineering. The mish-mash of fencing and shade structures are an impressive display of natural resource utilization. Even more impressive is the age of many of the houses, dating back into the 1800s. They were built of clay-baked bricks formed from the local soil, covered in lath striped from endemic wood, plastered and capped off with a palm-frond roof. Most have a large veranda to cast a deep shade on the activities of the day including al fresco meal preparation, cow hide tanning, and cheese making from the ranch’s own goats or cows. In the deep shade of this first ranch home I can vaguely see the Rancher’s wife at work. Chickens, cows, and one ominous looking bull roamed freely around the house – a tawny cow lounging just feet from the veranda under a shade tree. Up ahead is a “village” of four remaining homes which lie like acorns under the expansive branches of ancient oaks. The four homes are situated in a square – two in front and two in back. But only two of the homes look inhabited. One, it turns out, was recently abandoned. Fernando tells us that he has known the old man that lived in the abandoned house for years. We step closer to the main house to see that all the man’s belongings are still in the home – yet more history lost to this valley. Trying to adjust my eyes from the bright sun I step into the doorway and am astonished by what I see. Wasp squatters have taken over the home. From every surface a honeycomb dangles – rafters, furniture, window sills. Then, for the first time, I see the squatters themselves –everywhere. I am utterly enraptured in this scene when Fernando breaks my attention with an ardent suggestion that we move on. “They will attack,” he said matter-of-factly. Regaining a semblance of maternal instinct I take Celia’s hand and lead her away from the house-hive. At the home caddy-corner to the house-hive three women had gathered on the front porch – no doubt as interested in the little blond girl and crazy redhead muttering at her camera as we are in the village. Fernando speaks with them for a moment. They confirm that the old man had passed away. He thanks them for their time and we move on. Our next destination we are told is a village called El Gallina (Although I am a little confused because the web tells me it is El Rosario) which we enter by dipping into a river bed lined with green palms. Three very happy cows wade in the hoof deep water cooling off. Fernando owned a home in El Gallina until a hurricane toppled it some years back. The village is a collection of about 20 families, a church, an El Centro (city center) with a gazebo, a school, and a medical clinic. It is quiet except for the children playing in the school yard across the way. There is no traffic. We stop and visit with another friend of Fernando’s – a shirtless elder, sitting in the shade of a palapa. He greets us kindly and shares with us a piece of handiwork – a smooth, red clay bowl topped with a woven palm basket rim. It is an impressive piece given neither potter’s wheel nor kiln. As Fernando catches up on the gossip in town, I mentally take inventory of the 30-odd photos that I would take if the %#&@ camera would just focus. Focus dammit! But it turns out that I hadn’t seen anything yet. We wound up a dirt road past a man standing in the back of his truck bed pushing approximately one ton of residential waste into a roadside ravine. He has the sense to look ashamed while we pass but then goes right back to the task. Just ahead we pull into the shaded lot of the La Paz Cactus Sanctuary, a massive reserve featuring a half-mile marked pathway through the sort of cactus forests we had been seeing since we exited the highway. A very eager guide, Demetrio, greeted us at the entrance. Although I was interested in the reserve, my attention was caught by the bright colors and unusual structures in the cemetario next door. Seeing my interest Demetrio said in Spanish, let’s start with the cemetery. I doubt that his role as botany guide includes this diversion but I wasn’t arguing. The two men walked quickly past the multi-colored tumbas which are common today. Some are stacked 4 feet high with stone crosses etched with the requisite mortal statistics. Others are merely a pile of rocks marked (or not) with a hand written cross. Trying to take all this in and keep up with the men, I then see why we are in hurry to get to the back of the cemetery. Beyond the candy-colored monuments are larger, grander tombs – tumbas – from the regions hay-day in the mid 1800s. Although there are no names or dates on the massive tombs – some more than 8 feet tall – you can still make out telling details. One is clearly the tomb of a wealthy Chinaman – embellished with unmistakable Chinese patterns in the stonework. Others mirror the European design of the day. Seeing these tumbas is bearing witness to the silver and gold that formed these towns and made many families wealthy to this day. We hit the cactus sanctuary at the peak of mid-day sun. Even in the lattice work of shade provided by the towering plants, it was hot. The flies were all too interested in our sweating limbs. I could see that a botanical tour at this point might not go over well with my withering 7-year-old. Little did we know that Demetrio had treats in store for us. With all the gusto of a guide who hasn’t seen a tourist in weeks (quite possible) our leader brandished a 10 foot long stick with a sharp knife on the end and headed off down the path marked by white painted rocks. We first approach the solid giant of Baja cactus – the cardon. The specimen we stood before was easily 20 feet high and estimated at 500 years old – one of the oldest known specimens in the area. We learn how the ribbing of the cactus body casts shadows across the plant’s epidermis giving it constant relief from the sun’s harsh rays at all angles. I imagine a new design for the Baja home - I’ll call it The Accordion! Next we visit the cardon’s smaller but still skyward neighbor known as the Pitaya dulce. The guide uses his lengthy scepter to cut and skewer the brilliant red fruit that cling to the top of the plants up-stretched arms. These little thorny balls would naturally deflect the interest of gringos like us. First- they are nearly 10 feet off the ground. Second they are attached to a cactus and third, they are covered with spikes. But he knocks off the spikes with ease, tears the outer skin and reveals the succulent fruit inside. 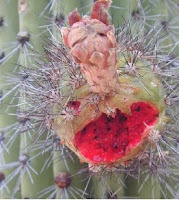 He juts the vibrant red flesh dotted with silken black seeds toward us and says “test. You test!” So I did. Taking bits of the plum- sized fruit in my fingers I test the cool, moist, slightly slimy center (better I die than Celia, I think). At once, Celia sees my surprise pleasure and she opens her mouth like a baby bird. I scoop out another bit and plop it into her mouth which quickly turns up in a big smile. Truly – this pitaya stuff is amazing! The closest thing I can liken it to is a kiwi or dragon fruit which I've only foundi n Viet Nam [Note: after a quick google search I learn that dragon fruit actually IS pitaya!] but is it sweeter than both. Its high water content instantly refreshes us and we turn our eyes upward for more. As luck would have it there is also a blanca pitaya and we soon get to test its equally delicious fruit. Moving on with this cactus smorgasbord we sample the Cardon Barborn – a cactus giant that produces golden puff-balls of pure joy. Inside seed packets that look like the Tribbles that invaded the Spaceship Enterprise, there resides yet another delight perdido.